Editor’s Note: This is the final post of “Fantasy Baseball Preview Week!” For more info, click here. Baseball is full of narratives fans and writers can just make up, and no one can easily fact-check them. I don’t think the people making up the narratives do it intentionally, but they see a few facts fitting their preconceived notions and use confirmation bias to solidify their point every time they see another example. One such example is about certain pitchers breaking down as the season goes on. The discussion’s main focus usually centers on rookies and other young pitchers being unable to carry a full-season workload. Another example is the theory I heard recently is that smaller pitchers wear down more quickly. When looking at pitchers’ first- and second-half splits, sometimes a pitcher performs worse, but most of the time there is no change. Jungmann wasn’t the only rookie to see his ERA (and FIP) jump in the second half. Lance McCullers’ ERA and FIP jumped by 1.28 and 1.44, respectively. For Joe Ross, it was a 3.07 and 1.33 increase. For Matthew Wisler, the bump up was 1.18 and 2.18. 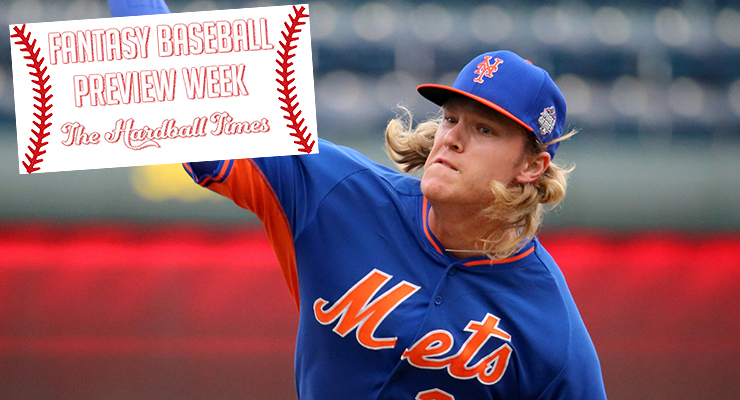 Noah Syndergaard saw a 1.04 and 0.24 increase. Other rookies seeing both stats jump were Chi Chi Gonzalez, Eduardo Rodriguez, Cody Anderson, J.R. Graham, Williams Perez and Michael Montgomery. I can see why the narrative exists. Truthfully, the idea also holds about hitters. Shane Tourtellotte did some outstanding work on the subject in his 2015 Hardball Times Baseball Annual article, “Hitting the Wall: Do Overused Catchers Fade Late?” Focusing on catchers, he found both June and end-of-season sags in performance. Pitchers threw a minimum of 20 innings in each half. I used greater than two innings pitched per game to designate starters and fewer to designate relievers. To find the final differences, I found the median change among all the pitchers in each category. I’ll start with some information overload with all the data in a table. For the various categories, I examined the change in FIP, ERA, K%, BB%, HR/9, and BABIP. The red values are the most extreme low values and the blue ones are the most extreme high values. The relief and starting pitching numbers may seem off when compared to the combined numbers: The combined ERA goes up 19 points, the starting value only 16 points and the relieving value 11 points. The combined number should be between the two other values. The key to this difference is that some pitchers change roles from one-half season to another. These role changers won’t be included in the starting or relieving groups, but only in the combined group. Let me break down the data into some workable chunks of information. Across all three pitcher groupings, the overall ERA and FIP went up, with ERA seeing almost five times as much increase as FIP. The key to the difference is BABIP increase. More non-home run hits are occurring in the second half, which can easily be attributed to warmer weather and the ball traveling farther. The combined values should be the baseline for the rest of the values. Comparing the starter and reliever values, the starters fall in line with their overall values. Relievers don’t see much of a change from the first to the second half. A nearly half-run increase in ERA takes place in the second half, with the pitchers’ FIP barely moving. The increase in FIP is due to a bump in HR/9 because, on average, rookies see a higher strikeout rate and lower walk rate as the season goes on. The major difference between the halves is a 14-point increase in BABIP. I think part of this jump is pitchers lucking into a nice first-half BABIP (see Anderson, Cody), then regressing to a normal value in the second half. If the rookie pitchers had abnormally high BABIPs in the first half, it’s likely that they didn’t make it to the second half and got demoted to the minors. I think their second-half results may have a component of them wearing down, though I do wonder if people are just seeing regression at work and don’t like that to be the answer. In truth, the rookies are seeing solid improvement in the two most important stats — strikeout and walk rates. For rookies, I think it is best to concentrate analysis on ERA estimators like FIP, xFIP, SIERA and kwERA. The big surprise in the age brackets is that younger pitchers (a group that includes some of the rookies) show no signs of wearing down. Instead, it is the 33-year-old or older pitchers who see a second-half decline. The young pitchers see improvement in all three of the FIP components over the course of a season and continue to have a higher-than-normal BABIP. There are no indications that young pitchers break down over a season. The older-pitcher talent decline isn’t as straightforward and consistent as seen with the younger pitchers, but the more aged pitchers do seem to get hit around a bit more (higher BABIP and HR/9), which pushes up their ERA and FIP. I expect these older pitchers see a velocity drop, but since many likely have large contracts, they will keep pitching away. I don’t see any difference in pitcher production based on height. The smaller pitchers don’t seem to wear down any faster than bigger pitchers. If I squint hard enough, the starting pitchers 6-foot-6 or taller are the ones who start breaking down. Also, in case you’re curious, “Just Rauch and Sisco” refers to 6-foot-11 pitcher Jon Rauch and 6-foot-10 pitcher Andy Sisco, who are both pretty tall dudes and so I separated them out. All pitchers, on average, performed worse in the season’s second half than the first. The reason could be pitchers wearing down, but more likely there is some regression and survivor bias at work. The decline is more significant for rookie and older pitchers. The rookies are likely seeing some of their early-season batted-ball luck erode, though they do improve in strikeouts and walks. The older pitchers are probably just wearing down. Using height as a proxy for size, there is no noticeable decline because of height. In discussing whether a pitcher is wearing down, examine his performance from the two time frames. Look to see if the pitcher had some early-season BABIP luck, with his stats regressing from there. If you want to focus on a group of pitchers who seem to actually wear down, look at pitchers in their 30s. This group sees its stats degrade the most. As a whole, it is difficult to show that one group of pitchers wears down in the season’s second half. And if you are looking for some pitchers to improve, look at young pitchers who haven’t been surviving off BABIP luck. This pitcher subset experiences real improvements. How much different is September stats than other months? I would think that pitchers wearing down would be offset somewhat with the decrease in quality of opponents due to callups ,star players being shut down and extra rest days. Fly balls carry further in hot weather, so wouldn’t that explain the increase in HR/9? How about position players tiring, couldn’t that explain the increase in BABIP? Seems there’s too much noise in a lot of this. Would looking at pitch count, fastball velocity, strike percentage or LD% be better indicators? The highest run scoring months of every season are July and August. Maybe the data could be presented as ERA+ vs. MLB average? Regression works both ways. However, warmer weather and teams optimizing their lineups as the season progresses may explain much of the decline. I don’t think we can rule out the fact that some pitchers decline is due to wearing down. Like much in statistics, what is a satisfactory explanation for the sample population as a whole does not apply to each individual.